This recipe was taught to me by Lorenza di Medici when I took groups to learn to cook from her at Badia a Coltibuoni. 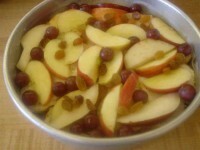 Place the raisins in a small bowl, cover with hot water and let sit for 15 minutes. Drain and discard the water. Place the bread in a medium sized bowl and cover with 1 cup milk for 5 minutes. In a third bowl, mix well the eggs, remaining cup milk, salt, sugar, lemon zest, flour and cornmeal. Peel and slice apples and pear. 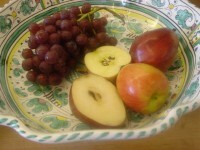 Remove the seeds from the grapes if desired. Butter an 11-inch cake pan. 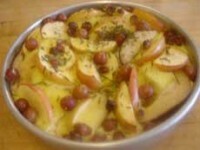 Lay the soaked bread in the pan and arange the fruit evenly over the bread. Pour on the milk mixture, adding more milk if necessary to barely cover the fruit. Sprinkle with chopped rosemary and 1 Tbs. sugar and drizzle with olive oil. Bake in a preheated 350 degree oven for approx. 1 hour. Serve at room temperature or reheat slightly the next day.